Wonderboy is without a doubt one of the finest franchises of 8 and 16-bit gaming. Easily capable of holding its own with classic staples like Zelda and Mario, the Wonderboy games have gone woefully unappreciated, not because they’re inaccessible, but simply because so few have even played them. Those that have experienced the backbone games of this series know that it is truly one of gaming’s greatest. So to them, I offer this retrospective to look back and reflect on this amazing line of titles. To those who have yet to play these games: sit down and let me fill you in. One of the problems in documenting the Wonderboy series is that it isn’t really a coherent “series” at all. It is essentially two or three related series, merged into one, and the seams show. There are two Wonderboy 3s, no Wonderboy 4, and the last game in the series stars a girl. The two main series at work here are Monster World and Super Wonderboy. the problem is that there isn’t always a clear division between the two. Some games are a part of the Wonderboy series, some are a part of the Monster World series, and some are a part of both, but in the US they were all merged into one series. In my view, the Monster World series is greatly superior to the other games and is my main reason for doing this, so keep that in mind. Confused yet? Well it gets worse. 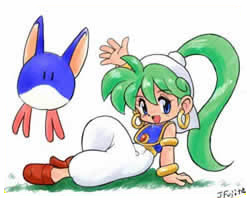 The Wonderboy/Monster World games were not developed by Sega. They were done by a small developer called Westone (also known as Escape in their early days), and published by Sega. Sega owned the rights to the names, bosses, and main characters, but Westone retained the rights to the games themselves, which they sold to Hudson soft, which resulted in ports on the PC Engine or NES with new names, bosses, and characters. The best known of these was Adventure Island. Some of them were downright hilarious. You’ll see them all as we move on to..
Wonderboy’s beginnings were humble. In 1986 Sega published an arcade platformer from newcomer developer Escape (who would later change their name to Westone). The game was released on Sega’s System 8 hardware in the wake of Nintendo’s Super Mario Brothers, and featured a blend of addictive linear arcade platforming with colorful, well drawn visuals and catchy music. Sega ported the game to their new home console, the Sega Master system, and Hudson published a clone with new characters on the NES known as Adventure Island. Adventure Island and Wonderboy are in fact the same game. The NES port gained more popularity than the original, and spawned several sequels of it’s own, none of which Escape/Westone were affiliated with. While Wonderboy may bear little resemblance to the games which would later bear the name, it still laid some of the groundwork, and helped gain some notoriety. This game was not only the second game in the Wonderboy series, but more importantly it was the first game in the Monster World series, which is what I really want to get at here. Like the first game, Wonderboy in Monster World originated in the arcades on the System 8 hardware. Despite it’s arcade routes, this entry took a hard left turn, for a more console styled design. While still a platformer at heart, Wonderboy in Monster World abandoned the tropical Island trappings of it’s predecessor and began fusing the game is RPG themes and elements. Although it was an arcade game, you could go in houses, talk to villagers, kill monsters for gold, buy items and equipment, and explore dungeons. There was a timer however, so you weren’t free to wander all you’d like just yet. Still, this is very much where the primary foundation for later Monster World games originated, and a great game in its own right. The game got a home port on Sega Master System called Wonderboy in Monster Land (Super Wonderboy in Monster World in Japan), which fared fairly well and was one of the few arcade ports on the system to retain the brutal difficulty of its parent. There was also a mutation available on the Turbo Grafx 16 and Famicom, again by Hudson. It was called “Bikkuiman” which translates literally as “Astonishing Man” a bad play on the original title character. The character designs in this variant were not only absurd, they were ugly beyond reproach. But it seems to be the pattern that the bad mutation would gain more attention than the original, and Bikkuriman not only spawned his own spin offs (including one on DC!) but an anime as well. There’s no accounting for taste. This was the 3rd game in the Wonderboy Series, and represented yet another complete change. It was released in 1988 on Sega’s System 16 hardware. This game retained both fantasy and tropical themes of the first two, with a sword wielding hero who hopped on islands and collected fruit. It was a side view shooter of sorts, with forced scrolling, and forward firing, but it still required the player to run and jump, and perform various platforming gauntlet. It wasn’t really like a Contra styled game, but it wasn’t a pure shooter either. Anyway, it’s little more than a side note in the Wonderboy lineage, and it has little to do with the games that would follow. It had a port on Genesis and on PC Engine CD. The latter had the name shortened to “Monster Lair” but for once the character was more or less the same. It also featured some nice remastered red book audio. Ok, this is where the naming gets confusing. This game was conceived of as “Monster World II“, a direct sequel to Super Wonderboy in Monster World. However, due to the late date at which it was released, it never came out in Japan (until it was released on Game Gear years later) where the SMS was struggling. Since The Monster’s Lair never saw a US release, Sega decided to call it Wonderboy III. As far as Westone is concerned it is both the 4th Wonderboy game and the 2nd Monster World game. Although the SMS version didn’t make it to market in Japan, if you play it in a Japanese mark 3 it will say “Monster World II” at the title screen, have Japanese language support, and even FM music support. That aside, this game is downright amazing, and in my opinion, is where the series really came into it’s own. As I mentioned earlier, this game is the sequel to Wonder Boy in Monster World, and it continues exactly where it left off, in terms of story and game play. The characters of the games are the same, and in fact the last battle of WBinMW is the first of Wonder Boy 3, so they actually overlap. In terms of game play, WB3 is able to do things on the console format it could never do in the arcades. It featured a large continuous world in which you were free to travel back and forth between levels, and a huge amount of secrets to reward you for doing so. In addition to that and perhaps more so than it’s predecessor, it featured some old school platforming gauntlets, which were very nice in and of themselves, making for a balanced fusion of platform, and action/adventure styles. It also featured a creative gameplay hook to keep things fresh. Every time you bested a boss in Wonderboy 3, he would curse you to take the form of an animal. These animal bodies each had different abilities. For example, the Mouse Man could run up walls and on ceilings and fit in small places, and the Piranha Man could swim in water. Later in the game you could change bodies at “transformation chambers” opening up all kinds of puzzles and secrets. The game didn’t proliferate to as many systems as previous entries. There was a Japanese Game Gear release which was very close to the original. There was also the usual Hudson bastardization (Called Dragon’s Curse, this time). It was pretty much identical, just recolored with a higher palette, and the character was either changed to a girl or an incredible effeminate man with a tiara, I can’t tell. Different bosses too. It’s still a decent port. It is my humble opinion that Wonderboy III stands the test of time as the greatest 8-bit game to originate on a home console. It was fun, addictive, fresh, and perfectly balanced, and would be a high mark to top. In Japan this game was known as Wonderboy V: Monster World III. As that name implies it is yet another “platventure” in the vein of previous Monster World titles. It was released in 1991, making it on the early side of the Genesis’ cycle. The game took place in the same old Monster World, but at an ambiguously later point in time with a new hero, a blue haired man named Shion. Initially I never thought much of the game, and I suspect a lot of would-be fans overlooked it in the same way. The gameplay physics offered the same sort of floaty 8-bit feel as previous games, which was beginning to be considered obsolete. More than that, it was a bit slow to start and lacked a real novel gimmick like the transformation system to hit you over the head. But earlier this year I decided to make a real attempt to delve into this game finally, since it is a prominent entry in my favorite series, and once I got over the hump I found that it really is an excellent game worthy of the Monster World name. Most of the elements handled with the transformations before are handled by using or equipping different items or weapons (which is actually more flexible in a way). It also featured a much more expansive over world and longer quests, with many towns. And like it’s predecessor it featured a ton of secrets. Really ace stuff. The game only has 2 ports that I’m aware of. One was on the SMS, one of the last English language releases for the system. It wasn’t nearly as good as it’s big brother though, and was obviously stripped down for technical reasons. Still if you didn’t have a genesis at the time I doubt you would complain. There was also a PC Engine CD port again, called Dynastic Hero. this time Shion had been replaced with what can only be described as an incredibly bad Mega Man rip off with a phallic helmet. Worth it for the remastered soundtrack anyway. Genesis was pretty good about not missing out on major imports, a lot better than SNES was anyway, but the one game that we truly got cheated out of was the final, and some say best, of the series: Monster World 4. This was not a Wonderboy game, but it was a Monster World game. It featured a female lead, Asha, and a new world, modeled after the Middle East. Westone seemed to acknowledge the reasons why Monster World III never gained the popularity of its predecessor and made some huge inroads for the 4th entry. In addition to the aforementioned Arabian setting and female protagonist, the feel and control had been very much updated, the artwork was absolutely gorgeous and once again, a novel game play gimmick was implemented. For Monster World IV, Westone introduced Pepeloogos, a popular pet kept by residents of its world that I can only describe as a cross between a cat and Nintendo’s Kirby. This could be used as a “helper” to solve puzzles, allowing Asha to hitch a ride and glide, double jump and more. The world also shifted back to a “hub” structure like WB3/MW2 where worlds branch off from a central town. However the town was packed full of stuff to do and people to see, so it retained more of that RPG feel. But at its heart it was still the same good stuff that has always made Monster World so great. Familiar monsters return, along with some choice faces, even though the world is different. Again, there are a ton of memorable boss battles, and diverse locales. It really is a great mix of new and old. The music is terrific as well. Although Monster World IV was never released in an English market, Demiforce has generously made a hack of the game which translates it entirely. I think if I had to criticize Monster World 4, I’d say that there really didn’t seem to be much in the way of secrets and side quests, and the difficulty was a bit plain. It also didn’t have those 8-bit styled platform parts, which can be a good or a bad thing depending on who you ask. But all in all the game was one of the very best on the Genesis (arguably better than Sonic) and another reminder of just why this series was and is so great. After one of their games went over time and over budget, and they had been long without a real hit, Westone closed their doors in 2001, seemingly signaling a death knell for the Wonderboy/Monster World franchise, which Westone still considered their flagship series. However in November of 2002, Westone resumed their operations and have recently begun work on porting some of their titles to PC and cell phones. While I cannot say if another Monster World is in the cards, and such a project would require the endorsement and cooperation of Sega, I do have it from a credible source that they would very much like to continue the series with a new chapter. We can only wait and see what their next move will be. Stay tuned.